Things are progressing in celestaville. Not as quickly as I want, of course, but time in the workshop can be scarce. This weekend I made some good progress, though! A few weeks ago I drew up all the plans I needed to build the action for each piece. I sketched each piece of wood individually, noting its dimensions and where I’d need to cut grooves and dadoes and rabbets and all those fun things. I also noted some jigs I’d need to make… including a kind of a sled that would slide on my table saw and hold pieces upright. I decided to make this as a kind of a box. And I figured, while I was making a box, I’d use finger joints to hold the joints together! That led me on quite a lengthy detour. Finger joints are one of the simplest joints to make, but getting everything consistent was a big challenge and led me to refine several of my techniques. 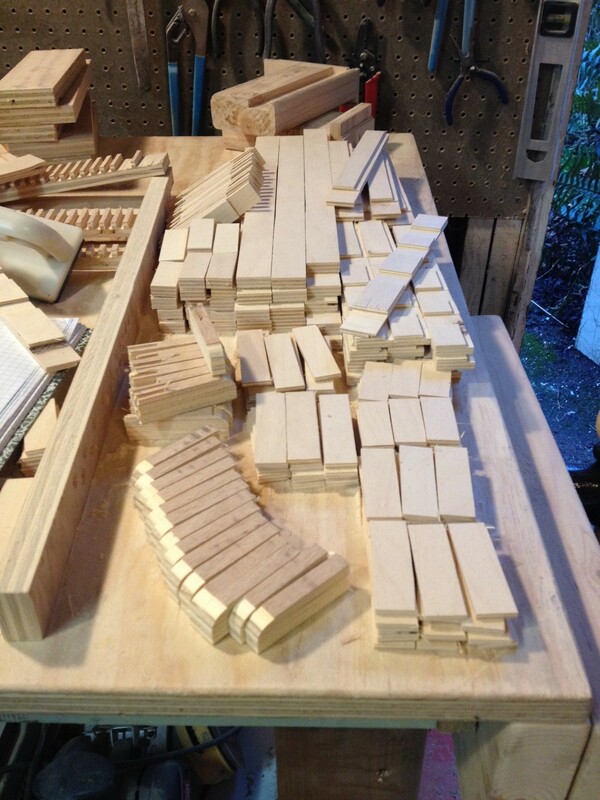 In fact, I built a different sled first — one that would make consistent finger joints — so that I could then make the box that would let me do nice tenons without losing any fingers. I’m currently working on a whole octave’s worth of notes. We’re still in the prototyping stage, but when this is all done and assembled there should be an ugly thing that can make some music. This entry was posted on March 14, 2012 at 3:32 am and is filed under woodworking. You can follow any responses to this entry through the RSS 2.0 feed. You can leave a response, or trackback from your own site.